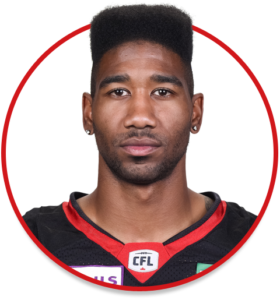 Jonathan Rose is a defensive back currently playing with the Ottawa REDBLACKS. Had 55 tackles, one sack and an interception during the 2016 regular season. Played in 32 games from 2013-15 with the Cornhuskers, starting five games as a senior and making 42 tackles (30 solo) and one interception … As a junior in 2013, had eight special teams tackles … Transferred to Nebraska after playing for the Auburn Tigers in 2011, where he played in nine games … Led Leeds High School to a state championship in 2010.